Charles “Smokey” Brantley Aycock Brown Jr., 86, of Wanchese, NC went home to be with our Heavenly Father on Sunday, March 3, 2019. He was born July 19, 1932, to the late Aycock and Esther Brown. Brantley grew up in Dare County and loved fishing, hunting, boating, and photography. His dream and love for flying led him to become a pilot for the North Carolina Forestry Service. 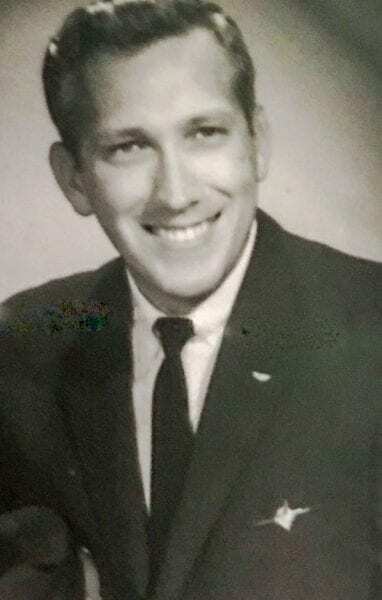 He later went to work for Piedmont Airlines and US Air where he was captain for 25 of his 30 years of flying with over 24,000 logged hours accident-free. Retirement took him to Fort Lauderdale, Fla., where he was a captain on one of many water taxi boats. In November 2015, he returned home to Dare County to be with his family. Brantley is survived by his children, Nettie Tisch and husband Tom, Charles Brown, Margaret Lee and husband Maywood, and Cindy Brown; eight grandchildren, Heather, Luke, Mary, Daniel, Christen, William, Emily, and Kate; eight great-grandchildren, Noah, Haley, Ava, Lawson, Sabra, Hunter, Fisher, and Colton; and several nieces and nephews. In addition to his parents, he was preceded in death by a son, William Michael Brown; brother, William K. “Billy” Brown; and a sister, Esther Gale Ballance. The family will receive friends and relatives at 3:00 pm on Thursday, March 7, 2019, at Twiford Colony Chapel, Manteo with a memorial service beginning at 3:30 pm. Pastor Steve Smith, Manteo First Assembly, and Pastor Stephen Wescott, Coastal Family Church will be officiating. In lieu of flowers, memorial donations may be made to the American Heart Association, 4217 Park Place Court, Glen Allen, VA 23060 or online at www.heart.org. Twiford Funeral Home, Manteo is assisting the family with arrangements. Condolences and memories can be shared at www.TwifordFH.com.